The MANY flavors and Tastes of Tu B'Shevat™ are very exciting for those of us who love exploring with our senses! The smell of the spices, the taste of the sweet dried fruits, the sight of the multi-color grains and nuts…the list goes on! Combine all the above mentioned ingredients and drizzle the dressing on top. 1) Cut bread into bite-sized pieces and toss into a large bowl. 2) In a separate container, combine olive oil and some favorite spices - oregano, basil, thyme, garlic, and of course salt. Shake/stir really well to get all the flavors combined. 3) Pour dressing over the bread cubes and shake up to evenly distribute the flavor. 4) Spread out the croutons on a baking tray or casserole dish. 5) Bake at 200°C to 225°C (400°F to 450°F). After about 7-10 minutes, shake the tray to make sure croutons are evenly cooked. Feel free to drizzle another bit of olive oil on them! Bake another 7-10 minutes, until they reach the color and crispnes that you prefer. 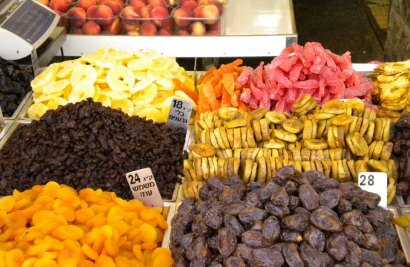 Another tradition during Tu B’Shevat is the consumption and giving gifts of dried fruit. This ritual is drawn from the years of Diaspora Jewish life in Eastern Europe and elsewhere when they couldn't get fresh fruits in the winter. This is yet another taste that we in Israel savor during Tu B’Shevat. Today, in the markets throughout Israel, dates, pomegranates, olives, avocado, persimmon, oranges, carob, sabres (cactus fruit), grapes, almonds, walnuts, pecans, apples and other beautiful fruits and nuts are transformed into delicious delectables to be shared by family and friends. Some people observe Tu B’Shvat by tasting 15 (“TU”) different types of fruit! In celebration of Tu B’Shevat and the Land of Israel where the fruits and trees have symbolic meaning, The Israel Forever Foundation is helping you feel connected to Israel and the tradition of Tu B’Shevat! Explore our Israel and Tu B'Shevat materials that emphasize the importance of Israel and her importance in our personal lives. Do you want to have your personal Tu B’Shevat Plant Israel at Home? Order Dorbanit Israeli wildflower seeds today! Grow your love for Israel in your home, garden, windowsill, office - anywhere that will always remind you of your love for Israel.